First let me say that I created a weddingwire.com account specifically to leave a review here. This is not something I'd normally take the effort to do but our videographer was so talented and kind to us on a day we'll never forget. My husband and I got the highlights package, which was around $2500 at the time we booked it and a steal for the level of quality we received. Our main film is 8 minutes and includes some wonderful moments neither of us managed to witness on the actual day itself. Weddings are so busy and it's easy to miss things, so it's great having a great deal of candid shots. We also got a short film which is perfect for Facebook. The mood of the day was clearly considered when the films were shot and edited. We'll cherish them forever and will highly recommend them to anyone looking for a videographer. Hi Natalie! We loved working with you both. Thanks so much for the kind words and for sharing our work. :) Have a great time in Italy! During the wedding, my sister had a panic attack for reasons I can't get into. Sean was so understanding and kind, bringing a calming energy to all of us. Soon my sister was smiling and laughing again like before and I'm sure we owe this partially to Sean. We all cried when we saw the video. The lenses he used made us all look so glamorous and the way the footage was edited really enhanced the mood! We booked the Ultimate package because we wanted the whole ceremony and toasts. This came with three videos and they were all beautiful and unique in different ways. I also want to thank Sean because he helped us out by editing some of our home movies for us into a really nice compilation so we could show it during our reception. He was happy to give us a custom quote and work within our budget. We had very specific needs for our wedding video and Sean was quick to meet those needs. Our ceremony was several hours long and the video covered all of it. If you have a hard time finding what you need in the packages listed by your videographer, contact them and see if they'll customize things the way he did! Sean came highly recommended by the wedding coordinator at the venue my husband and I got married at. Video was really important to us so we shopped around. We ended up booking Sean because we liked his style, specifically the way his previous films were edited. After having looked at many different videographers, it seemed like Sean was doing really unique things with color and sound design. When we first made contact through wedlockcinema.com, we got a prompt response. Unfortunately another couple was already in the process of working with Sean on our date. Discouraged, we continued shopping around. Lucky for us, about a week later we heard from Sean, saying the other couple decided to have their friend film for them. We all got coffee and talked about the timeline. At no point did anything feel salesy or awkward. The whole time, Sean seemed really relaxed and confident, like he had a plan. When the wedding day came, everything was beautiful. The day went by super fast but I kept noticing him getting all the little details, which I was glad to see in case I missed anything given the fast pace. When the sun started to set, the photographer and Sean worked well together, sharing every second. Sean asked my husband and I to do a few things that seemed a little odd at the time but made perfect sense when we got the video. We trusted him because it seemed like he knew what he was doing and it paid off! The shortest of the films we got is my favorite, as it is really, really detailed. It seems like a LOT went into putting it together both with the filming and the editing. Colors popped. Sounds were seemingly enhanced somehow and everything had this dreamy, romantic glow. My handsome husband looked more handsome than he normally does (and he's super handsome). I even looked pretty good! Basically, we had the best wedding day and we cannot recommend Wedlock Cinema enough to anyone looking for really unique, special, beautiful footage of themselves and their guests. We must thank you both so very much for being kind and incredibly lovely during every step of the process. We will miss working with you both and wish you the very best in your married years ahead! We originally didn't think our budget allowed for a videographer but as we got closer to the date we decided to go with WedlockCinema. Sean filmed our wedding and was with us all day. He made my wife who is normally a very shy person very comfortable. Less then a month after the date we got our finished videos and they are so amazing. The way the camera moves is very big budget and professional. We couldn't be happier with the results. We needed a videographer last minute and Sean hooked it up! He worked really hard all day and did his magic. He brought in a couple of experienced drone pilots to shoot for a couple hours too. In the end we got this really epic video. He sent us several updates throughout the editing process so we could weigh in on things creatively. We ended up just going with his suggestions and it was definately for the best! My sister in law booked Wedlock Cinema for us for our wedding shower as a gift! After that, we got lunch with Sean and went over the timeline that our planner had made up. Immediately, we knew this guy had worked his share of weddings because he asked all the right questions. We were happy he was so easy to talk to because this is someone we were going to be spending a great deal of our wedding day with. Come the day, Sean showed up quite a bit early to start getting location shots but he didn't disturb us. One of my bridesmaids went out to the car to get something and she saw him with his camera working away. He was very discrete throughout the rest of the day except for a five minute portion he had blocked out with us to take some stylized shots. During these few minutes, Sean directed us and was able to get some of the most incredibly artistic angles. We asked for a same day edit, so Christine was editing pretty much all day, while Sean filmed. During the reception, we watched our video and were stunned by the level of production quality they were able to squeeze into a film with such a tight turnaround time. We were so, so, so, so, SO happy with the finished film that it made us both cry. To any who are thinking about getting video, we strongly recommend you go with these guys. They go above and beyond to please! We've watched our wedding movie at least once a month since we were married! They did really nice, high quality work and gave us more than we could have asked for! They did a same day edit for us too so guests who were not able to make the ceremony got to enjoy some of the earlier parts of the day. Very, very, very impressive! We originally hired them to film my bachelorette party. It was so good, we agreed we wanted them to film the wedding. We're so glad we did, as the video we got was amazing. Neither of us have ever looked more like movie stars! I had so much fun working with you both! Thanks to you and your family for being so incredibly kind to me and making me feel like a guest at your wedding. I must also confess I now my first positive association with the Backstreet Boys, thanks to your bachelorette party! Excellent videographer. From our first conversations we knew he truly cared about helping us find exactly what we wanted. 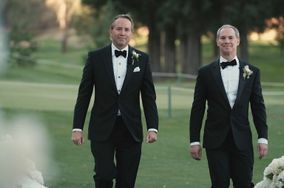 The slow motion shot of us walking down the aisle doing our little victory dance will always be a favorite!